So we are still in Kernville, Astro our faithful van has broken down and is in the garage, hopefully to be reunited with us tomorrow morning (fingers crossed). 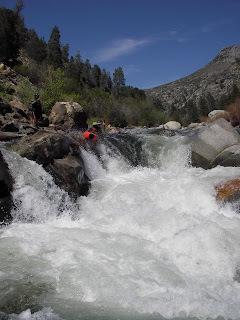 We were fortunate enough to have somewhere to stay whilst Astro is incapacited, Thanks Alex, and whilst it is a low water year, the Forks of the Kern is a classic whitewater run, just upstream of town. During our extended stay, we ran the Forks section a couple of times, together with some other sections of the Kern, and also did some amazing mountain biking. 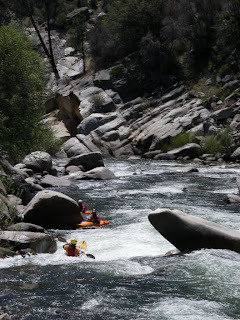 The Forks of the Kern is a Class 4/5 run, usually 14 miles long. We cut a bit off by hiking in about mid way, and cutting out some of the flatter bits. 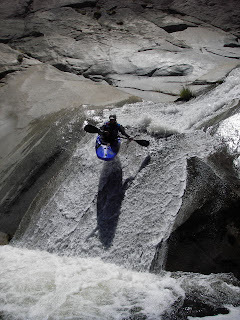 This is a remote wilderness area, and we didn’t see anyone else on this section. Dry meadow creek drops in about two miles from the end of the run. What people don’t tell you about Dry meadow is the heinous boat carrying that is needed. Levels were too low to be worth running, but we hiked up. I was glad I didn’t carry my boat up there….. 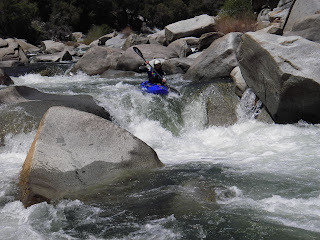 The last slide of Dry meadow creek provided some amusement without too much boat carrying. The Forks section has many long lass 4 rapids, and a couple of short harder class 5’s. It makes for a long day after the shuttle and hike in. Taking a break from boating, we broke in our new mountain bikes on the ‘Just Outstanding’ trail. Starting up in the clouds at 6800 ft, we decended on some superlative singletrack through dense manzanita tunnels to 2500 ft. There was snow in the trees at the top!!! And about 80’F at the bottom. Hopefully Astro will be well again tomorrow, and we will be leaving Kernville, and heading north. Thanks to everyone who made our stay here so enjoyable!! !